Rural women are silent workers and fundamental contributors to rural economy. Their economic contributions are often gratifying but not widely recognized. Women’s participation in agriculture has grown exponentially during the past 15 years in Bangladesh. Now a days, rural women in Bangladesh play a vital role in a wide range of income-generating activities through agriculture, which include post-harvesting, cow fattening and milking, goat farming, poultry rearing etc. Women also play a key role in home gardening and vegetable growing. Despite their domestic work, rural women in Bangladesh are performing an active role in ensuring household food security. They not only ensure protein supply of the family by rearing livestock or poultry but also contribute to household diet by growing various vegetables and fruits in homestead garden. Farm activities in the homesteads, ranging from selection of seed to harvesting and storing of crops, are predominantly managed by women. According to statistics, rural women contribute 25-50 percent of household income in rural families. 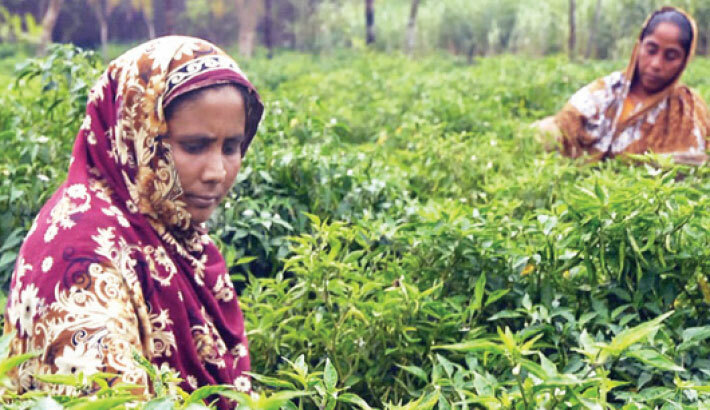 Well, a large majority of households in Bangladesh depend upon agriculture and women are now becoming a vital part of these agricultural activities. So the role of women in agriculture should be recognized properly for enhancing agricultural and rural development and improving food security in Bangladesh.